Since I garden in the South, I figured there are certain iconic Southern vegetables that I should try to grow, including collard greens. I sowed a short row of heirloom Georgia collard green seeds (from High Mowing Organic Seeds) in my raised bed in early March. Germination was fairly successful and the plants grew surprisingly well considering that the leaves were devoured by insects on a regular basis. I garden organically. As I understand the term 'organic', that means no synthetic chemical herbicides, pesticides or fertilizers. I do this partly out of concern for the environment, partly out of concern for my own health and partly out of a belief that gardeners shouldn't have to rely on chemical companies to grow their food. Organic gardening does permit the use of certain organic fertilizers, pesticides and herbicides, but I guess I'm either lazy or laissez-faire because I rarely apply any of those either. In fact, so far this year, I haven't applied any pesticides or herbicides at all, and the only fertilizer I've applied has been a liquid kelp and molasses mix. Anyways, I'm not saying this to brag, I'm saying it because I want to say that if you have any hopes or plans to garden organically, you should realize that certain crops may come through without too much damage, while others will be eaten to nubs. Collard greens, as you can see, falls into the devoured-by-insects category. 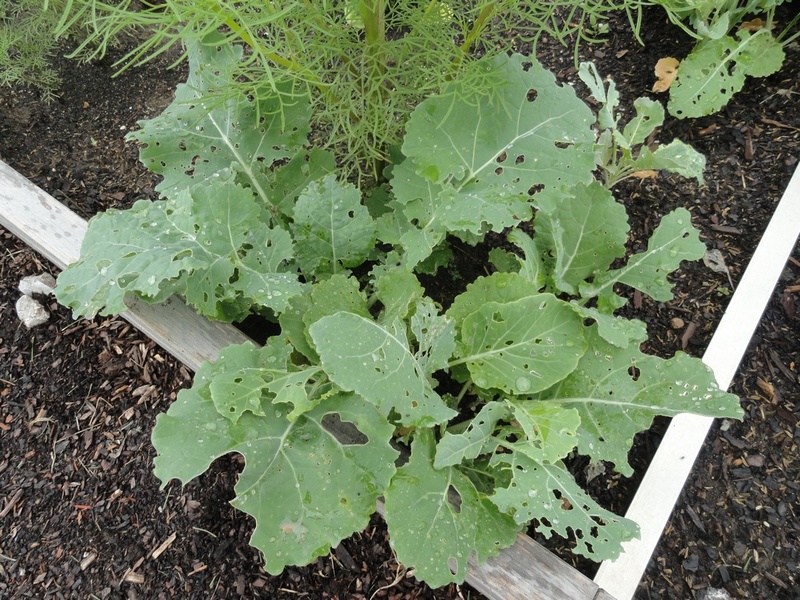 I suspect cabbage loopers, who may also be the culprit in the attacks on my mustard greens. If this looks bad from above, the truth is far worse, because when you go to pull the collard greens, there on the underside of pretty much each and every leaf, you'll find one or more small caterpillars, a smattering of insect eggs and other detritus. Nonetheless, I persevered, pulled the entire row of collard greens, salvaged the leaves that were still somewhat intact, brushed off as many caterpillars and eggs as I could and took the leaves inside for a good washing. 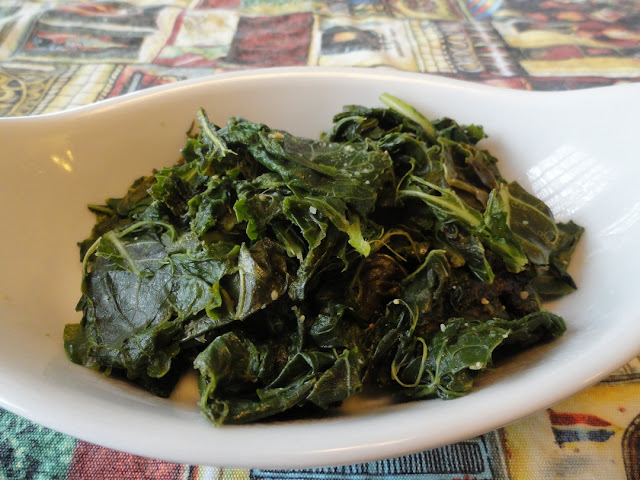 The collard green recipe I found online called for tearing the leaves into pieces, discarding the center stems, boiling the leaves for 10 minutes, draining them, then sauteing them in olive oil and seasoning them with salt, pepper, garlic and a splash of olive oil. How did it taste? The first bites were promising, a bit zingy, a nice crunch or two, but things went downhill from there. As I kept chewing, the collards left a rather mushy, bitter impression. I didn't think they were awful, but they were definitely my least favorite of all the different kinds of greens I grew this spring (lettuce, spinach, mustard and collards), the least attractive, the most insect-eaten and the kind that took the most prep work (boiling and then sauteing, whereas most other greens are just fine raw or with a quick saute). Oh and then there's the fact that the entire row of collards (a short row I'll grant you, but still) ended up yielding just the one small dish of greens pictured above. So will I be growing collards again? I don't think so. And in my humble opinion, neither should you. 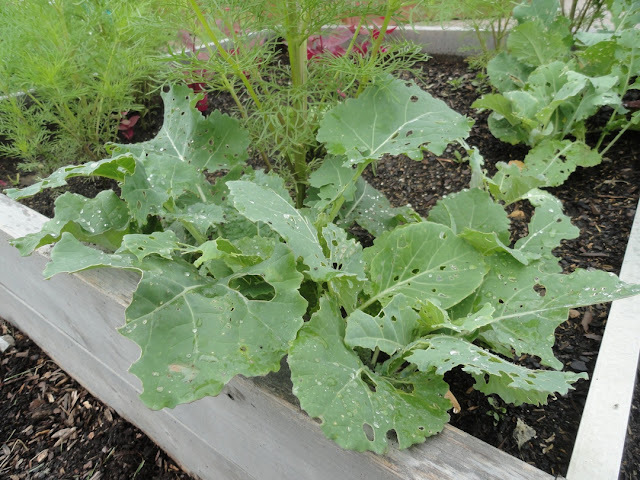 There are too many other exciting, productive, delicious, easier and more pest-resistant crops to waste time and space in your garden on collards. Lovers and defenders of collard greens, I have thrown down the gardening gauntlet! I await your rejoinder.